Horror and mystery shows were common and diverse in the Golden Age of Radio. Perhaps the most stylishly fun of all of them, however, was Inner Sanctum Mystery. Introduced by the trademark creaking door (a sound effect actually created by a rusty desk chair) and The Host with a macabre basketful of puns and bad jokes about murder, death, and mayhem, it just had more fun with it all than any other series. When the Hermana Sebastiana prayed God to discharge on her the punishment due all the sins committed in her country, she expressed the social reason for the beaterios, which was to atone for the evil done in the world. Each beaterio was the ten just men in Sodom for whose sake the Lord would not destroy the city. What's being cherished here is human community: the belief that Christians form such a solidarity that what some lack others can make up for, and that the entire body draws health from the virtue of each member, which is the doctrine of the Communion of Saints. The beaterios lived out that doctrine and the beati fostered the sense of community which their later secular counterparts, the patriots, would develop into a sense of nation. Even in aberrant form -- for example, the 19th-century manangs' absurd ways of using indulgences for the dead -- the basic idea remains beautiful: that human beings are so linked to one another we can, through the good we do, nourish each other even beyond the grave. Nick Joaquin, "The Beatas of 17th-Century Manila," Culture and History, Anvil (Mandaluyong City, Philippines: 2004) pp. 190-191. And how could he ever have thought himself alone, wondered Currito. Why had he ever supposed the world against him! It was he, rather, who had set himself against the world, against the human community of which he was part but had always rejoiced to play the outlaw and outside which he now desired to place himself eternally, by dying unrepentant, by dying in despair -- the last gesture of utter egoism. And the world laboured to save him now as it had laboured to save him all his life. Monks were rising in the cold night to worship -- because he had worshipped so little. They respected silence -- because he had babbled so much. They enslaved their flesh -- because he had been enslaved by his. Nuns went hungry (to atone for his greed) and were chaste (to atone for his lust) and humiliated themselves (to atone for his pride). For such is human solidarity that where any of us lack others may supply and the virtue of a single member nourishes the entire body. Nick Joaquin, "The Legend of the Dying Wanton," May Day's Eve and Other Stories, Anvil (Mandaluyong City, Philippines: 2016) pp. 58-59..
One of the most successful series of the entire Golden Age of Radio was Fibber McGee and Molly. Created by Jim and Mary Jordan, who played Fibber and Molly in the fictional Midwestern town of Wistful Vista, it ran for twenty-four years as a consistent favorite, thousands of episodes. The series was a masterpiece of running gags -- recurring jokes given slight twists and variations that entered into the comic vocabulary of the everyday life of its listeners. The most famous of these is the Hall Closet, the single most famous sound effect in the history of radio. They also were major pioneers in what became a common element in radio comedy -- instead of treating the midpoint commercial as something distinct, they integrated it into the show as Harlow Wilox, the announcer, would turn any subject of discussion into an enthusiastic endorsement of Johnson's floor wax. The list could be continued. Fibber McGee and Molly is arguably the most influential sitcom in the history of broadcasting. "Gildy's Halloween Party", from 1939, is a good introduction to the people of Wistful Vista; while it's still early in the series, we get a good selection of some of the perennial favorites -- Mr. Wilcox, the Old Timer and Horatio K. Boomer (played by the same actor), Teeny ("Sis"), Abigail Uppington, and Throckmorton P. Gildersleeve (who would eventually get his own very popular spin-off series). The mix of music and comedy scenes is more typical of early episodes than late episodes, which increasingly focus on the latter. O Almighty God, inspire us with this divine principle: kill in us all the seeds of envy and ill-will; and help us, by cultivating within ourselves the love of our neighbor, to improve in the love of thee. Thou hast placed us in various kindreds, friendships, and relations, as the school of discipline for our affections: help us, by the due exercise of them, to improve to perfection; till all partial affection be lost in that entire universal one, and thou, O God, shalt be all in all! Joseph Butler, Fifteen Sermons Preached at the Rolls Chapel, Sermon XII, "Upon Love of Our Neighbour". Benevolence is the first of the five major components into which Whewell analyzes the Idea of Morality; Justice is another. An adequate Idea of Morality must be applicable to human beings qua human; thus it must exclude desires that, as Whewell says, "merely tend to their center in the individual, without regard to the common sympathy of mankind" (EM §232). Benevolence addresses part of this, by the cultivation of affections in light of the general good of humanity itself, but Justice takes another part, by discipline of mental desires so that everyone should have their own. Whewell therefore starts with Justice in terms of the primary notion in light of which 'justice' and cognate words were understood in the eighteenth and nineteenth century, property. Yet simply focusing on property is not sufficient -- Benevolence, for instance, also may be concerned with property, as we see with Virtues like Charity and Liberality. The issue that seems to arise with property, insofar as Justice is concerned, is that property and wealth are means to ends, and thus use of them gets its value from the value of the ends; but one may also treat them as if they were merely ends in themselves. This is why greed is a negative term, for instance, and yet is contrasted with Virtues like Economy or Frugality. This also explains why Justice applies to things that do not deal with property as such -- property is a form of power, and the seeking of forms of power in general as if power were itself an end rather than a means to a further end is vicious Ambition, while seeking them for good further ends is laudable Ambition; the former is inconsistent with, and the latter an expression of, Justice even if no property is involved. When judging in personal matters, the Virtue expressing Justice is Fairness or Impartiality, the disposition that "represses our own desires, whether of money, power, victory, or any other object; and contemplates the desires and claims of other persons with equal favor" (EM §254). The Duty of a Spirit of Justice excludes all Cupidity or eagerness in our desires of wealth; all Covetousness, or wish to possess what is another's; all Partiality, or disposition to deviate from equal Rule in judging between ourselves and others. The Rule of action is, Let each man have his own; but the Rule of desire is, Let no man seek his own, except so far as the former Rule directs him to do so. Justice gives to each man his own: but each ought to cling to his own, not from the love of riches, but from the love of Justice. Because it applies to desires, there is in the case of Justice as in the case of Benevolence a duty of moral self-culture; we must develop the practice of seeking and holding property as something only to be done for Justice, and when we claim our just rights it should be as part of our effort to make sure that everyone can claim their just rights. As with Benevolence, the effect of Christian morality on Justice is to intensify and incentivize. The opposition to cupidity of any kind, in fact, plays a major role in the moral precepts found throughout the New Testament. The early Christians were a small community within a much larger population, and so, Whewell notes, they had a tendency to emphasize their opposition to the vices of that larger society, among which were love of money and oppression of the poor. In the same way, and for the same reason, the moral precepts of the New Testament often indicate that Christians should avoid standing too much on their rights. The Duties of Justice for states are much what one would expect, and are heavily concerned with matters of remedy for inequalities arising through history, in such a way as respects the rights of all involved. As we come up toward Halloween, it seems time to do a few more Radio Greats post. This episode is not Halloween-themed, but it does deal with something that has come to be associated with the holiday -- mummy curses. With Johnny Dollar you know it's going to be no-nonsense -- but that doesn't mean there won't be mystery and suspense! Two people die, Dollar never gets closer to Egypt than Paris, and we learn that money can make nice people do very bad things. You can listen to "The Curse of Kamashek Matter", from September 1956 at the Internet Archive (41-45), or at Old Time Radio Fan, and in YouTube format from Waynes Old Time Radio Page. You can probably find it elsewhere, as well; it seems to be a popular one, and deservedly, I think. More applause ensues and the samurai commits hara-kiri. As a Virtue, Benevolence considers all matters involving the affection of love, whether the love be conjugal, parental, filial, fraternal, or the love of friends, of fellow citizens, of the whole human race. "When these natural Affections are directed to their proper objects, and regulated by Reason," Whewell says, "they are virtuous Affections" (EM §238). Because of this, we can divide up the dispositions associated with Benevolence in a lot of ways, but some are particularly common, and form the vocabulary of Benevolence. For instance, the natural running of virtuous affection is called, under various circumstances, Good-will, Good-humour, or Good-nature. Good-humour may be harmed by various irritating factors, and because of this there are virtuous dispositions to uphold Good-humour even in the face of such provocations: Mildness, Meekness, Gentleness. Or we can divide them up in light of the circumstances in which they are relevant: where the affection is concerned with perceived commonality, we have the disposition of Fellow-feeling, where it is concerned with pain, we have Compassion, Pity, Mercy, and Charity as it exhibits different lights in the context. There are in addition supplementary virtues that are dispositions not directly involved with the affection of love, but for one reason or another are closely connected to it: Hopefulness, Cheerfulness, and various dispositions concerned with moral Zeal. The Virtues give the vocabulary for talking about Duties, which are expressed in specific rules arising from general moral principles. The general principle expressing the character of Benevolence is what Whewell calls the Principle of Humanity: "Man is to be loved as Man" (EM §269). Applying this to our social relations and circumstances, as well as our internal tendencies, gives us Duties, the fulfillment of which, when habitual, becomes a Virtue. Those associated with Benevolence are learned by beginning with those affections that are naturally strongest; the more general affections are expansions outward from an inner circle of more immediate affections: "The Natural Affections are the proper moral School of the Heart" (EM §281). Because of this those things that are closely associated with the maintenance of these natural affections all become Duties; Whewell's list of examples is: Gratitude to Benefactors, Compassion, Reverence for Superiors, Filial Affections, Parental Affection, Conjugal Affection, Fraternal Affection, Love of our Fellow-citizens, Universal Benevolence, Compassion. These must be cultivated as part of the "School of the Heart", and without them there is no possibility of really attaining to the Virtue of Benevolence in is full and proper form, and so the rules appropriate to them must be followed in order to be moral. The rules involved here, however, are rules for affections -- they are about how we must work to set up our inner life -- not rules for specific actions, which Whewell says can only be determined by taking into account all the rules for affections at once. From the fact that these are all Duties for cultivating affections, it follows that we also have a Duty to cultivate our affections in an appropriate way, by how we direct our thought, by practicing appropriate actions, and by putting ourselves into appropriate situations. This Duty of Cultivation of Affections will generally overlap the Duties concerned with the affections themselves, but will affect how we perform them by requiring us to take into account how the performance shapes our character. Such is Benevolence in natural morality, but Whewell also considers Benevolence in the light of two special domains of moral life: Christian morality and the morality governing states and polities. Christian morality, as Whewell conceives it, is not a distinct kind of morality, but is a way of taking natural morality and investing it with religious significance and sanction. They thus take the same Duties and both raise the standards and intensify the motivations for them. States also have Duties of Benevolence, however. It is because of Benevolence, for instance, that states are to recognize all human beings as having natural rights. Whewell takes the Duties of the state in this regard to include guaranteeing freedom (it is thus inconsistent with Benevolence for a state to allow slavery), giving temporary and limited relief to the destitute (Whewell argues that if it is not temporary and limited that this is not in fact Benevolent, because it does not involve supporting people in living their own lives), and forbidding cruelty to animals. These are certainly not exhaustive -- it's pretty clear that the reason these in particular come up is that slavery, poor law, and animal cruelty were all hot-button political issues in Whewell's day. The invasion of the Carduchian lands begins, with the Spartan Cheirisophus in the vanguard and Xenophon in the rearguard. The Carduchians, finding an army suddenly upon them, flee, leaving all their possessions behind. Despite the abundance of potential loot, the Greeks considered the possibility of later Carduchian alliance more promising as a contribution to getting home than any wealth they could get from the plunder, so they took only food and drink and left everything else. Attempts to coax the Carduchians out for friendly meeting failed, however, and the Carduchians would occasionally harry them with stones and arrows. The Greek commanders, concluding that they were still moving too slowly, agreed to release all recently taken captives and strip down their baggage even further. The soldiers were largely amenable to this, although, of course, some smuggling inevitably occurred. A further attack showed some disarray in the Greek army due to a failure in communication between the van and the rear; Cheirisophus operating on experience and Xenophon with his prudential planning occasionally end up at cross-purposes because they are in a situation in which the two sometimes take equally reasonable but nonetheless mutually inconsistent steps in the attempt to get the army home. Thus, for instance, Cheirisophus puts Xenophon in a bad position, one in which he loses brave men, because he takes the initiative to seize a pass that is said to guard the only route out, at the same time that Xenophon is taking the initiative to ambush and capture prisoners in order to discover if it is, in fact, the only route out. The plans both were reasoned and reasonable decisions, but as implemented they weren't properly meshed. Learning of another route, guarded by one hill, the Greeks put into effect a clever plan by which Xenophon provided a distraction at the same time that a group of volunteers caught the guards on the hill by surprise, with Cheirisophus charging in to back up the volunteers once they were in place. There were problems in the implementation of this, but it was largely successful in the end, and the army continued its way, having few problems beyond the heavy Carduchian arrows, which were able to pierce even Greek shields. They were glad to leave the country of the Carduchians, though, since they had been fighting for seven days straight -- the Carduchians were more of a threat than the Persians. No sooner did they leave the Carduchian lands, though, than they came up against a Persian army. 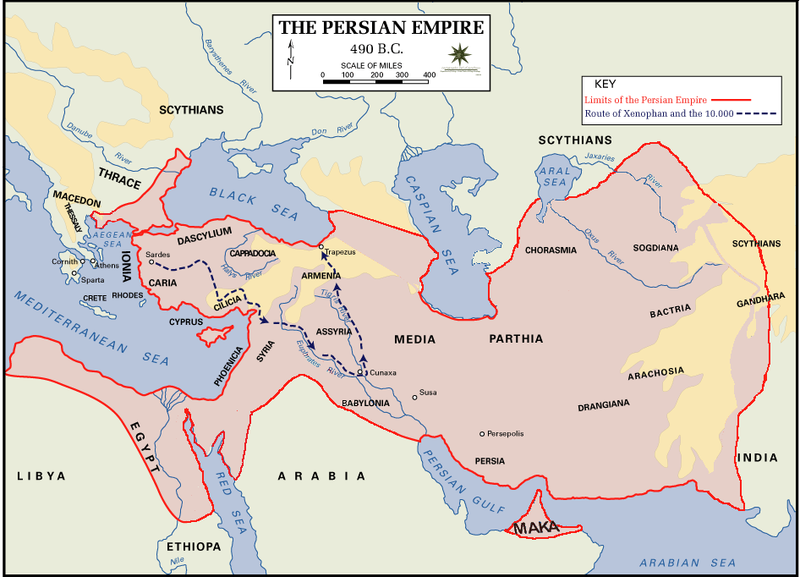 Pinned in place by a river, a Persian army, and a Carduchian army, the Greeks fell into despair. But that night Xenophon had a dream that he was bound by chains, but that these chains fell off simply because he willed them to do so, after which he could take long steps. The Greek word for taking long steps, diabaino, is the same word used for crossing a river, so it was a good omen. The Greeks sacrifices to the gods and read the omens, which were favorable, and then had breakfast. At breakfast, Xenophon received news of a shallow spot in the river that was shielded from the enemy. Upon hearing this report Xenopohon immediately proceeded to pour a libation himself, and directed his attendants to fill a cup for the young men and to pray to the gods who had revealed the dream and the ford, to bring to fulfilment the other blessings also. The libation accomplished, he at once led the young men to Cheirisophus, and they repeated their story to him. And upon hearing it Cheirisophus also made libation. The river crossing was a success, and the Greeks began their march through Armenia. The local governor, Tiribazus, offered a treaty, in which the Greeks would be allowed to march through if they behaved themselves, and it was accepted. They later hear rumors, however, that Tiribazus is planning on betraying them, and so attack his army, again successfully. This means that they have to hurry once again, despite hunger and a heavy snow leading to severe frostbite throughout the army. Once they start reaching villages, however, the Armenians turn out to be immensely hospitable, and provide valuable information, including the tip that they should wrap bags around their horses' feet to prevent them from sinking too far into the snow. Not long after, at the top of a mountain, they see the sea, which leads to great rejoicing -- at this point it must have been seen as one of the few things clearly suggesting that their hope of getting out alive might be fulfilled. They negotiate their way through Macronian territory, then battle through Colchian territory, until they reach the Greek coastal city of Trapezus. This, of course, is cause for celebration. They sacrifice to Zeus for salvation and Heracles for guidance, and arranged for athletic games. But, of course, they still have to get home. Now as soon as the vanguard got to the top of the mountain, a great shout went up. And when Xenophon and the rearguard heard it, they imagined that other enemies were attacking in front; for enemies were following behind them from the district that was in flames, and the rearguard had killed some of them and captured others by setting an ambush, and had also taken about twenty wicker shields covered with raw, shaggy ox-hides. But as the shout kept getting louder and nearer, as the successive ranks that came up all began to run at full speed toward the ranks ahead that were one after another joining in the shout, and as the shout kept growing far louder as the number of men grew steadily greater, it became quite clear to Xenophon that here was something of unusual importance; so he mounted a horse, took with him Lycius and the cavalry, and pushed ahead to lend aid; and in a moment they heard the soldiers shouting, “The Sea! The Sea!” and passing the word along. Then all the troops of the rearguard likewise broke into a run, and the pack animals began racing ahead and the horses. And when all had reached the summit, then indeed they fell to embracing one another, and generals and captains as well, with tears in their eyes. I finally got around to seeing the recent Ghostbusters movie, since it came up at the Redbox. Some thoughts. (1) It's not as thunderingly awful as one would have expected from the trailer. But it's also not great. It's like an OK TV movie, the kind you can bear to watch, but usually while you're doing something else more interesting. (2) For one thing, it's not very consistently funny. It does have its moments, but they are just moments. This is, as a lot of people have said, a problem for a reboot of one of the great movie comedies of all time. Most people seem to be a bit off, which is probably the biggest contrast between it and the original -- in the original no one, even bit parts, is really off. I re-watched it recently and there is a great scene in the hotel after they have fired on the maid's cart. After they apologize and turn around to discuss what to do, you can see the maid in the background trying to put out a toilet-paper fire with a spray bottle. It's the sort of thing you could easily miss -- entirely in the background, nothing in the scene is focused on it, but when you catch it, the poor maid (played by Frances Nealy) trying to spritz the fire out, in context it is hilarious. That wasn't just comedy; it was craftsmanship. There's not really anything like that here. But the real issue is that the main characters just don't seem to fit together well. They all have moments, but the attempts to play off each other are generally quite lame. Individually, they also struggle -- Kate McKinnon's Holtzmann is the kind of character that might have been funnier in a different kind of movie, Kristin Wiig's Erin is largely just awkward, and Melissa McCarthy's Abby is like a Melissa McCarthy character. Of the women, Leslie Jones's Patty ends up being funniest, but the fact of the matter is that Chris Hemsworth's Kevin steals practically every single scene he's in, despite the fact that the kind of comedy he's doing here is really minor-level stuff that should be funny background. (3) No movie that has this many call-backs and shout-outs to the original should be a reboot. It literally makes no sense whatsoever to do a straight reboot and bring in all of these cameos and references. If you can get Murray, Aykroyd, Weaver, Potts, and Hudson, it's going to raise the question of why you couldn't have just tied the original in from the beginning. And if you build so much on the previous movie, you lose all right to ask audiences to take the movie on its own merits -- it will necessarily be compared, at every point, to the original. Which, again, is an unusually high standard here. (4) The movie kind of works if you think of it as a kind of alternate-universe version. But only 'kind of'. There's not actually much story here. It looks originally like we're going to get a healing-of-friendship motif in the Erin and Abby characters -- but after the beginning it's not really built up. It ends up being a sort of self-esteem story about outsiders. That's OK, I suppose. Throughout this one, however, you get parts that could have been taken somewhere and never are, and it gets somewhat tiring. (5) One thing that the movie had me thinking about was how movie comedy has changed. Contemporary comedy in movies seems to be built more on awkward moments than carefully constructed jokes or even improvised hilarity. I think this is seen here, and the movie suffers for it. The blunder comedy works very well -- the majority of the genuinely funny moments in this film are blunder comedy. But the repartee is often awful as written and weak as delivered, and the actual jokes are usually more groan-inducing than chuckle-inducing. This kind of thing can be made to work -- it's a staple of comedies geared to teens -- but the whole movie seems structured in a way that is inconsistent with actually making it work. The result is mostly just corny and flat. (6) The special effects here are not all that good -- which is really disappointing, because that's usually the one thing that is guaranteed to be quality in movies today. The original special effects are much better, which is a devastating indictment given that they were done over twenty years ago. Subpar CGI is not an improvement. Rizal lamented that his people were converted to a religion they did not understand. It's absolutely sure that the early native converts understood the Faith no more deeply than did the Gauls or Goths of Europe; but if the same argument had succeeded in stopping the introduction into Europe of an alien Oriental religion the world would not have had Chartres or Giotto or Chaucer or Michelangelo. Nick Joaquin, Culture and History, Anvil (Mandaluyong City, Philippines: 2004), p. 121. This is a point that came up in discussing Shusaku Endo's Silence a couple of years back. the Cross of martyrs did not falter. The kings of the world were astounded. the sign of our holy redemption. the miracles of Christ pour from it. By it all nations are astounded. all who come to it are astounded.